The 29th seal of the Roboplastic Apocalypse crunches like Tauntaun drumsticks in the mouth of a Wampa being crushed by a falling AT-AT! Thrill to the adventures of the Nostrodomatron as I give in to the dark side of newspaper ads from 1980 through 1983 looking for toy robots ads in an era most nontoyrobotical, only to find the mightiest toy robot ever in the most unlikely of space opera toylines! It's an Empire Strikes BackCastalypse as I ponder the greatest mysteries of the Star Warses like is the AT-AT actually the greatest American super robot ever? Did Princess Leia use Bittorrent to download the Death Star Plans? And why are engineers who work for the Galactic Empire so obsessed with chickens and garbage trucks? Find out in this THAT'S NO SEQUEL-IT'S A DIXIE CUPS COMMERCIAL edition of the podcastalypse! YODA OR YODA NOT. THERE IS NO 22 BACK. 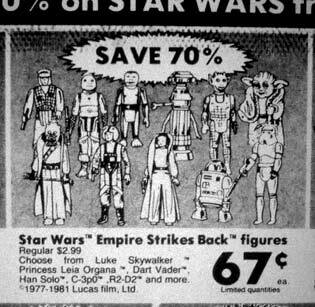 Back when I was a kid, Star Wars figures generally ran in the $2-$3 range. 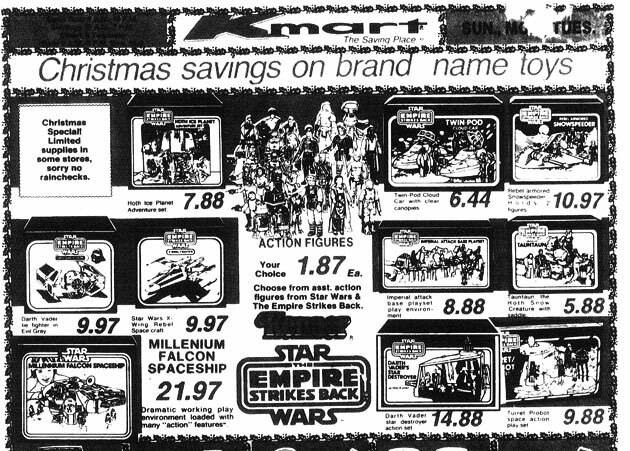 The ads themselves were never very interesting looking and that's partially why I don't collect them as I'm looking through old microfilm. During the early days of the line when there were only 21 figures or so it was not uncommon to see line art representative of the entire selection. You'd see single ads with almost two dozen figure drawings. This waned off during Empire as the number of figures increased. 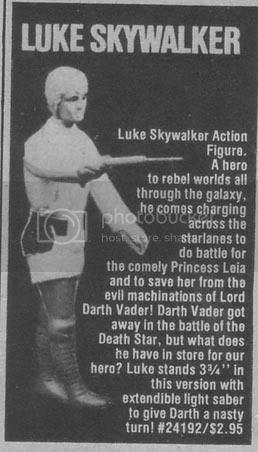 Then by Jedi whenever a store advertised Star Wars figures it was always with photos of a handful of examples. 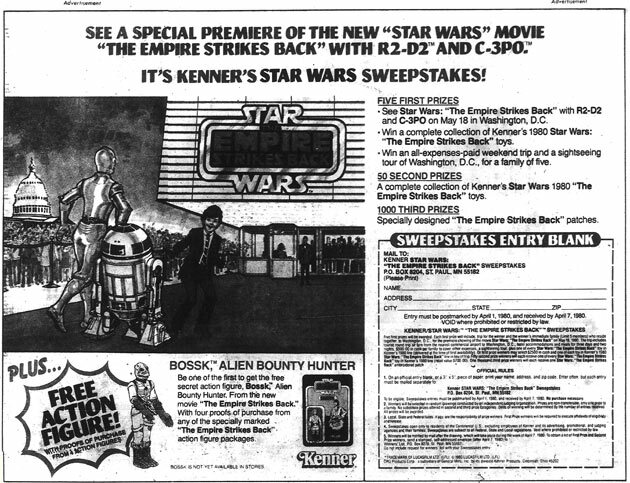 Probably my favorite Empire era ad is this one for the movie sweepstakes. I wish they would do things like this nowadays but I can understand how back then this was more of a big deal. Some movie theaters in the 80s didn't get movies on the day of their release. 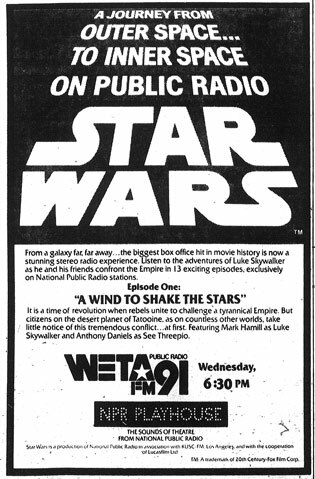 I remember reading the movie sections of old newspapers from Rapid City, South Dakota that showed Star Wars didn't arrive there until a full month after it was released in late May elsewhere. 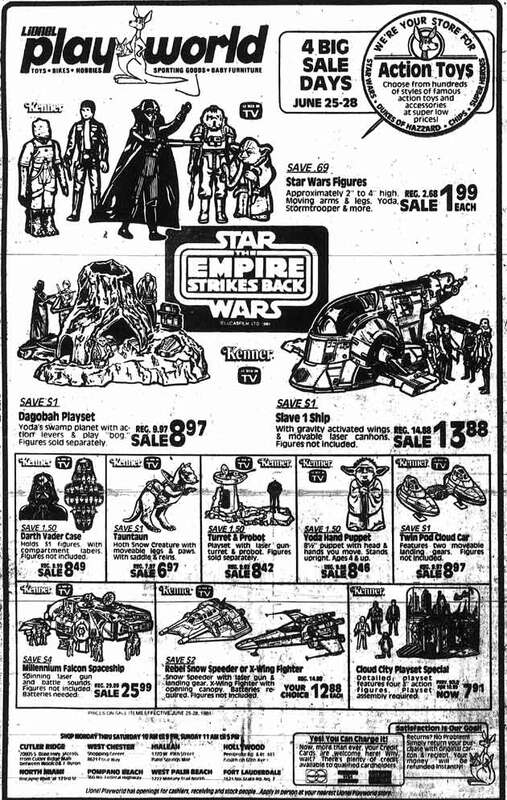 So contests like these were special, especially if you lived in a small town that wasn't going to get Empire on the day of wide release. Nowadays it's not such a big deal because theaters are everywhere. So what cool ships did the rebels get in the ESB line? Just the snowspeeder. With no large scale space battle, ESB was a bit of a dry spell for Star Wars space vehicles on the rebel and Imperial sides. The Slave-1 and Twin Pod Cloud Car came out but those were neutral in the conflict. 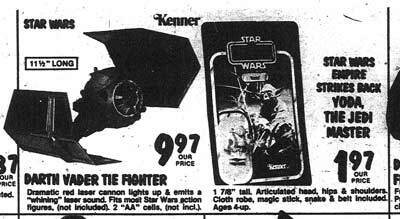 The Empire got major shafted because Kenner never released a TIE Bomber. Jedi would be the best toy commercial of the series in terms of spaceships released. Overall I find Empire's lack of mid pricepoint vehicles disturbing. 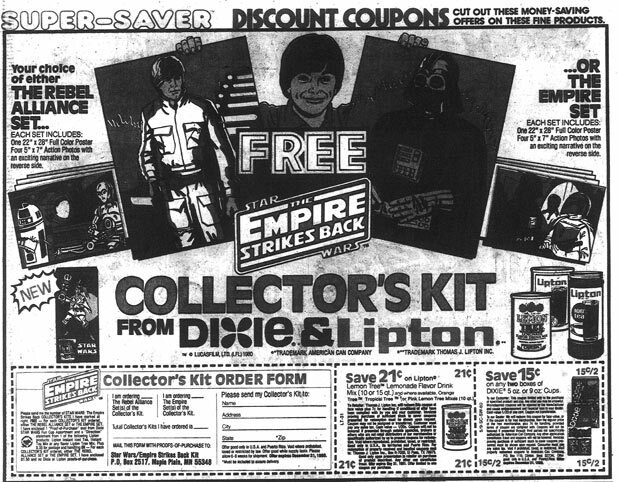 As a kid I never wondered what Darth Vader had to do with Dixie cups or pondered the philosophical implications of galactic civil war imagery on paper products. I just went with it and thought it was cool. Nonsensical cross promotion is my favorite kind. I didn't care what they were putting Star Wars on as long as the drawings were good. The greatest Star Wars tie in ever is still Puffs tissues. I wish I could find an ad for that. 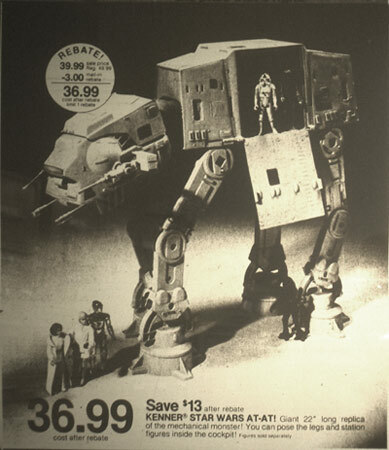 When I was little those Puffs boxes with AT-ATs on them were the most awesome thing I'd ever seen. 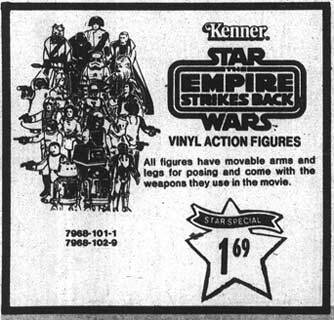 When I was a teenager I secretly wished they would have made Return of the Jedi tissue boxes with Slave Leia printed on them. It would have been convenient. Dixie cup collector's kits! I have never seen these before but they're probably well known in Star Wars circles. I like this ad because I've never found another one that has the electronic laser battle game. 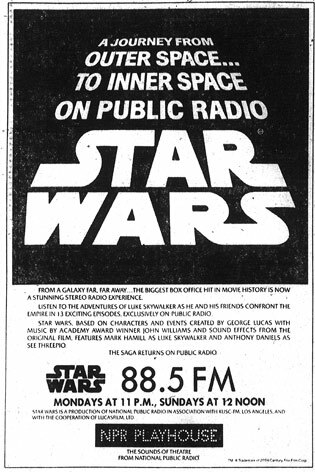 I tried to find ads for later episodes of the radio plays beyond this first one but I couldn't come up with any. They may exist in other newspapers that I don't have access to. 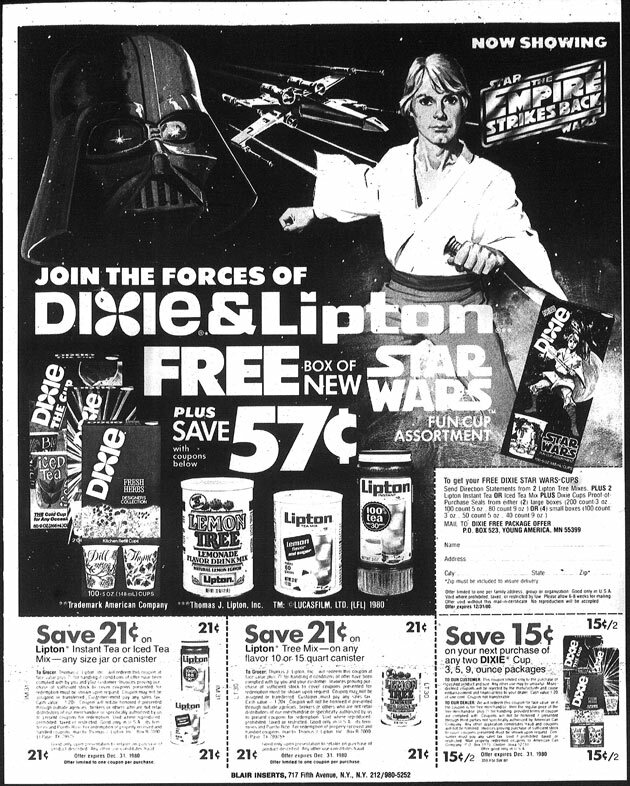 I've read that during the Empire Strikes Back episodes an ad was placed that included some sort of Star Wars recipe so I'm thinking I'd at least like to find that one. 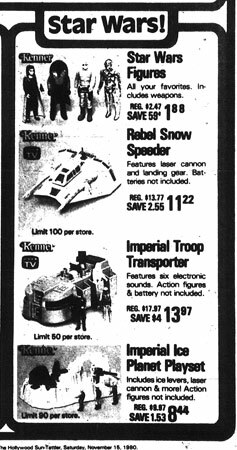 I really like the K-Mart ad above from November 30, 1980. It features pretty much every new Empire Strikes Back playset and vehicle from the 1980 line. Excluding the Star Wars carryover vehicles it really doesn't look like a very extensive toyline at all. 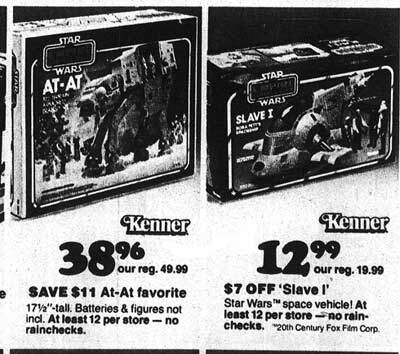 All the A-list vehicles like the AT-AT and the Slave-1 were held off until 1981, which is smart marketing. 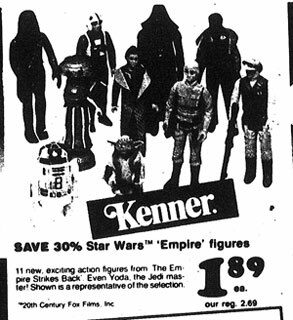 Kenner didn't overwhelm the market with product the first year and since it was going to be at least two more Christmases until the next movie, the smart move was to gradually release the line over time. I'm impressed with how certain scenes and themes from the movie were made into toys. 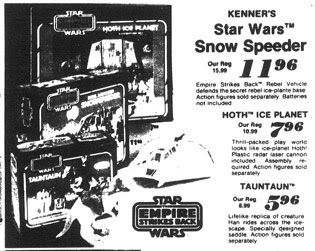 The only large scale battle of the film took place on Hoth so it's understandable why so many of the playsets are Hoth themed. Although Star Wars was praised as being very toyetic with lots of figure and vehicle possibilities, figuring out how to stretch the concepts out and make playsets took some thinking. 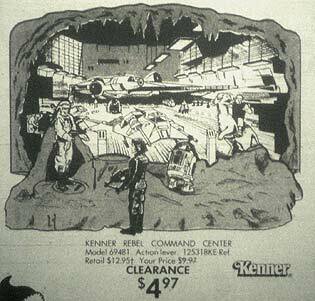 The Cloud City Playset is shown here in this June 24, 1981 Lionel Playword ad (also available via Google's newspaper archive). This is rather intriguing because this set is well documented online as being a Sears exclusive. 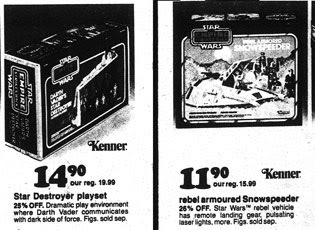 This is not the first time Lionel Playworld advertised a Sears exclusive-I've blogged before about how they also had the Sears exclusive Micronauts Mega City playset in an ad from October 25, 1979. There was obviously a connection between Sears and Playworld that allowed them to do this but I don't know how often it occurred. 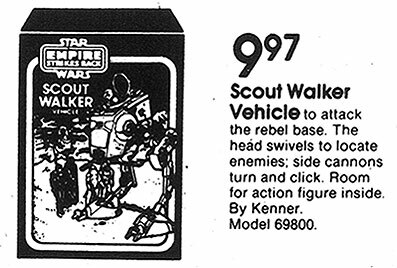 The Scout Walker would be another good example of packaging variations that would make Star Wars newspaper ad collecting interesting. It came out in three different boxes so it's possible that somewhere there exist newspaper ads featuring photos of each packaging variation. The line art above is based on the initial Empire Strikes Back release with the walker in the snow. The second version is the same backdrop but with a Return of the Jedi logo, and the third is the RotJ logo with an Endor scene instead of snowy Hoth. The toy only had room for one pilot. Based on how small they were in Empire compared to the AT-ATs I thought they were just one man machines too, but then in Jedi it's revealed their crew consists of two drivers. I can't imagine why George Lucas put two drivers in such a small vehicle unless he just did it to get people to buy more action figures. 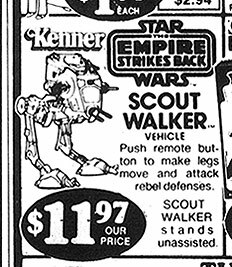 It's strange how they never made an AT-ST driver during Empire. Man, that 67 cents ad is a heartbreaker!